Invoice Template is a free invoice creation solution which allows users to create and send professional-looking custom invoices. The software is designed for small businesses, and is used by recruitment agencies, software companies, web developers, startups, and more. Invoice Template offers users a range of customizable templates, to which users can add their business’ logo, terms & conditions, notes, and more. Multiple products and services can be added to a single invoice, and users can choose to add VAT/sales tax with full control over tax rates. Flat rate and percentage discounts and shipping fees can be included, and tax can also be added on to shipping charges if required. Once complete, users can send invoices directly to customers via email from Invoice Template, with the option to switch on scheduled reminders to be delivered automatically. Additional files can be attached before the invoice is sent. Invoices can also be previewed, printed, downloaded, and sharing links can be generated. it is very easy to create an invoice. I have used this a couple times for invoices to clients. It is self explanatory and you don't need experience in creating invoices. You can change your currency, so anyone could use this. I wish there was an app I could use on my cell phone. That is why I switched and use another invoice creator that has an app so I can create invoices on the go. This is good for desktop use though! Invoice Template is very easy to learn and has great functionality. Less time wasted on creating my own invoice template.The User Interface is amazing. Very simple, yet elegant. It isn't difficult to quickly learn how to use Invoice Template, even after five minutes! With several different template designs and many togglable field options, it's easy to get your invoice set up just the way you like. Just fill in the fields (Company Logo field is available!) and click next. Then you can download a PDF for your personal records and email the invoice directly to the client. The User Interface is amazing. Very simple, yet elegant. It isn't difficult to quickly learn how to use Invoice Template, even after five minutes! With several different template designs and many togglable field options, it's easy to get your invoice set up just the way you like. Just fill in the fields (Company Logo field is available!) and click next. Then you can download a PDF for your personal records and email the invoice directly to the client. I wish I could make a profile where I could save template designs and previously sent templates. Other than that this product is amazing. It was a godsend.It's quick and super intuitive. 1. it saved us loads of time by being quick and easy to use 2. it's free 3. Beautiful templates It's really easy to pick up. We're a small team with lots of clients. We needed to get away from the Word template system and tried a few options online. Most were clunky and outdated. We just wanted to send invoice not learn how to use a new app! We came across Invoice Template via a recommendation from a client and haven't looked back since. It's really easy to pick up. We're a small team with lots of clients. We needed to get away from the Word template system and tried a few options online. Most were clunky and outdated. We just wanted to send invoice not learn how to use a new app! We came across Invoice Template via a recommendation from a client and haven't looked back since. Glad you're getting the most out of Invoice Template. We're continually working on building out the product, so expect to see some exciting features in the near future. maybe add more features.It does what I needed but I think could maybe use some additional features. I use this software frequently to design invoices for clients quickly and for free. There are paid options but the free one works perfectly fine for free and I often recommend this service to others. You can make a template in minutes and it is very editable. I really like minimal and well designed templates. My issue is that while many of the templates might be minimal they aren't designed very well graphically. Many of them could use a little pop of subtle color. However, for a free invoice template they do just fine. Invoice Template is completely free to use. Users can switch VAT/sales tax on and off for each invoice, and set custom tax rates. A range of templates are included, to which users can add their company logo, custom notes, and terms & conditions. Flat amount and percentage discounts can be added to invoices, and users can also add flat or percentage shipping fees, with the option to include tax on shipping. Multiple currencies are supported, including GBP, EUR, USD, JPY, CHF, AUD, and many others. Invoices can be sent out directly to customers by email, and users can set up scheduled reminders for unpaid invoices. Below are some frequently asked questions for Invoice Template. Q. What type of pricing plans does Invoice Template offer? Q. Who are the typical users of Invoice Template? Q. What languages does Invoice Template support? Q. Does Invoice Template support mobile devices? Q. Does Invoice Template offer an API? No, Invoice Template does not have an API available. Q. 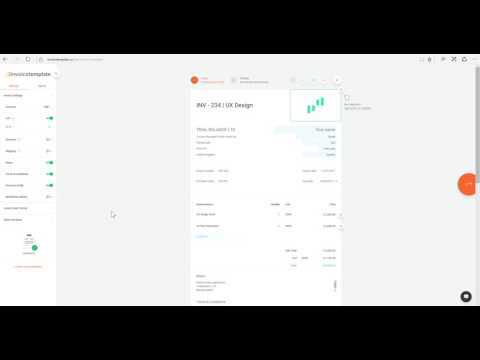 What other apps does Invoice Template integrate with? Q. What level of support does Invoice Template offer?